The competition, which is for young lawyers between 0-5 years post call will have 10 finalist contest for varying prizes ranging from 1st prize of N250, 000 (Two Hundred and Fifty Thousand Naira) cash with electronic law report, the second prize of N150, 000 (One Hundred and Fifty Thousand Naira) and third prize of N100, 000 (One Hundred Thousand Naira) respectively and other consolation prizes. 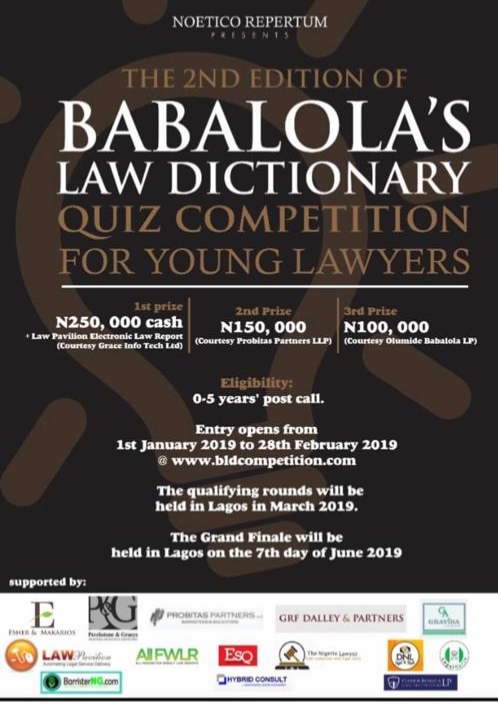 Entry into the competition is now open to all eligible Lawyers (0-5years post call) by logging on to www.bldcompetition.com. The qualifying rounds will be held in Lagos in March 2019. The grande finale will be held in Lagos on the 7th day of June 2019 and the event is proudly sponsored by: Probitas Partner LLP, - Perchstone & Graeys, Hybrid Consult, - Law Pavilion Electronic Law Report, - FWLR, - Esher & Makarios, Esq. Magazine, - www.nigerianlawyer.com, - www.dnllawandstyle.com, - www.baristerng.com, - and Olumide Babalola LP. Entry opens from 1st January 2019 to 28th February 2019 while the Grande finale holds in Lagos on the 7th day of June 2019 in Lagos.